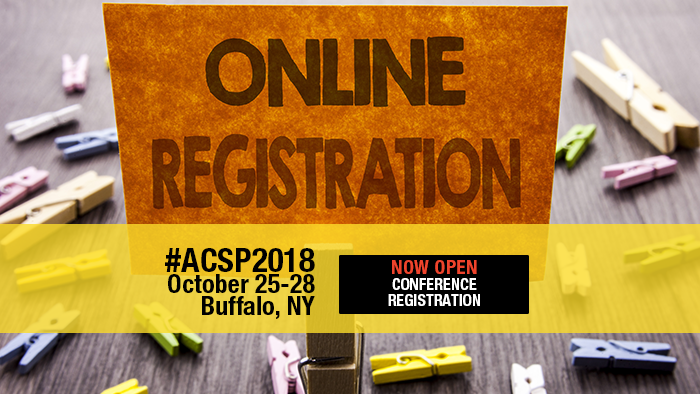 Registration Is NOW OPEN for #ACSP2018! Congratulations to Values Statement Focus Group Participant Daniel Kuhlmann on Winning a Free Registration to #ACSP2018! Stay Tuned to eNews & Social Media for More Chances to Participate & Win! Registration is now open for the 2018 Annual Conference! Choose Full Registration to enjoy all conference sessions along with the Thursday Opening Reception and Saturday Keynote & Awards Luncheon. Or, choose the Basic Registration package and add only the events you want to attend. Members ... For discounted member pricing, log in to your ACSP account and save! Members ... Did you log in? Members ... Just checking one more time that you’re logged in? It matters! Can’t remember your username and password? Email membership@acsp.org. Go to the Conference Registration page. Choose the registration package that meets your needs (Faculty, Student, etc.). Fill out the registration form! You will get an email confirming your registration. Not a member? Non-member registration package includes a one-year membership! Anyone on the program: If you are presenting a paper, a discussant, or roundtable participant, you must register for either the Basic or Full registration package; there are no one-day registration options for anyone presenting/participating in the program in some way. Are you a local planning practitioner? Local planners must be from the Buffalo/Western New York area in order to qualify for the one-day local practitioner registration option. Early bird pricing ends on August 28, and the hotel room block will fill up quickly, so visit the Conference Registration page and sign up today! Member Schools: Submit Your Open Planning Position & See Your School Listed Here! The First Three Are Free ($807 Value)!